Register for Revive '17: Women Mentoring Women. For more information to getting a copy of this message, contact Damaris Carbaugh. Leslie Basham: According to Damaris Carbaugh, when you get to know the Lord as your Shepherd, you’ll start to want Him more and more. Damaris Carbaugh: The Lord is my Shepherd, and I don’t want anything else! I just want to learn how to be in the secret of His presence. Leslie: This is Revive Our Hearts with Nancy DeMoss Wolgemuth, author of A Place of Quiet Rest, for Wednesday, April 26, 2017. Nancy DeMoss Wolgemuth: I don’t know about you, but in the busyness and craziness of life, I’m so glad that God invites us to experience true peace. My friend, Damaris Carbaugh, is going to help us find the source of that peace today as she walks us through Psalm 23. Damaris is a singer and a Bible teacher, and she’ll be joining us this September 29 and 30 at Revive ’17. The theme of this conference is Women Mentoring Women. Speakers like Damaris are going to be walking us through Titus 2 to help us see how to live out the beauty of the gospel together. You can still get in on the early registration discount for a few more days. Early registration ends May 1. To get more details on Revive ’17, visit ReviveOurHearts.com or call us at 1–800–569–5959. I’m excited to let you get to know one of the Revive ’17 speakers better, so here’s Damaris Carbaugh—giving us fresh insight into a familiar passage. Damaris: There are different opinions as to when the 23rd Psalm was written, but everyone agrees that the 23rd Psalm was not written by young David. This was not young David . . . this was a David who already had lived. I believe it was a David who was already in those years of almost becoming the King of Israel—not quite there. For many years he was running from Saul, and God had delivered time after time after time. He has a moment when he remembers his youth. He remembers his youth, and what he did. David took care of sheep. You and I are sheep. We are His sheep. Aren’t you glad? Do you know what sheep are? Dumb! I don’t mean to insult you; it’s just the truth. The Bible says to say everything in truth with love, so with love I tell you—you’re dumb. I’m dumb. We’re dumb. You will never find sheep in the circus—ever! They’re not jumping through hoops. They’re not riding the elephants. I mean, think about all the other animals that do tricks: the chimpanzees, the little Chihuahuas, the little poodles, birds, elephants that go like this, bears that do tricks. Not sheep. They’re not very bright. When I went to Israel (I’ve been to Israel three times), I saw sheep. They’re dirty. Here I was, kind of enamored with sheep, because we’re the sheep of his pasture. And before you think that I’m just insulting you, because I’m not, I’m not really insulting, because I’m one of those, too. I’m a lamb, too. Just remember that our Savior became the precious Lamb of God. He condescended and became like us. He knows how we are, and He became the Lamb of God. Remember that in Matthew there is a Scripture that says that in the end, God will separate the sheep from the goats. So when you do a little study on goats . . . don’t be a goat! Goats are sneaky little things. Let me just tell you something . . . goats have learned how to actually open up a gate and get out. Goats do not like to be lead; whereas, sheep do. As a matter of fact, that’s all sheep know how to do: “Oh, we’re going that way? Okay, let’s go!” Someone’s leading them or they’ll go off a precipice. That’s why sheep need a shepherd, and David remembers that. Aren’t you glad that God doesn’t waste anything you’ve ever learned in your life—whether good or bad? He doesn’t waste it! He works all things for good. That’s why He’s God. Oh my goodness, I could not do that—and you can’t do that. God didn’t waste what David was learning, even while he was being a shepherd. I think that while David was taking care of sheep he was clueless about where God was going to take him—clueless until maybe that day when Samuel anointed him, but up to that point, all he did was take care of them. And guess what? He took good care of them. He understands what a shepherd is supposed to be like. When he thinks one day, he goes, “Oh, the Lord is my shepherd; I shall not want! Because when I was a shepherd, there wasn’t a thing those precious little things needed that I didn’t give them. Whatever they needed, I gave them. If they need nourishment, I took them to green pastures. If they needed to drink, I took them to waters!” (see Ps. 23:1–2). So David knew where to take them to drink. “He makes me lie down . . .” Because I’ve studied this a little bit . . . He doesn’t say, “I just took them there and they laid down.” Hhe makes them lie down. Do you know why? Check this out (I think this is so cute)—they’re hyper! I remember one time our pastor (my pastor is my brother-in-law, and he is a godly man) was speaking. Louis (I call him Pastor Rivera, but he’s Louis because I’ve known him for so many years) was speaking. Louis is slow in his delivery, but he’s precious. And the Lord says to us, “Calm down. I need to speak to you.” He wants some of us to just quiet down. We’re hyper little lambs, and He wants to lead us beside quiet waters. You know that our Jesus, speaking to the woman at the well, offered her living water. Jesus describes Himself as someone who will give you living water. If you’re thirsty, you can drink. He offers living water. But the psalm says there, "He leads me beside quiet waters" (v. 2). Jesus Christ is Living Water, but Jesus Christ is also the Prince of Peace. I see Jesus in every portion of those Scriptures, right there. Jesus said, “I am the Good Shepherd” (John 10:11). What I would like to suggest tonight is that we would want Him! Do you know what I did for years? I did what the Israelites did. This is what Jesus said about the Israelites (and this is what God said about the Israelites, even in the Old Testament, and Jesus repeated it): “You honor me with you lips, but your heart is [what?] far from me” (see Matt. 15:8). Far . . . far . . . I don’t believe that when they quoted those verses, when they quoted Scripture—or when the Levites would quote it—I don’t believe that when they said those things they were in their minds going, “I don’t believe that. I don’t believe that.” No, no, no. I really believe they did honor Him with their lips, like many of us do in a service. We honor God with our lips. “My lips shall praise Thee, thus will I bless Thee.” I truly believe they honored Him with their lips, but then—the Lord is the only One who knows our heart! I cannot tell you how many years my heart was far from the Lord—and I never left the church. You don’t have to leave the church for your heart to be far from Him. And let me just suggest something else to you. Oh that we would be satisfied with God instead of always striving for what we think we should be striving for—even in the things of God. Oh that we would be satisfied with God—that we would want Him! I didn’t want the Lord. I’ll tell you one little thing that happened to me in Argentina (this is where God changed my heart). I was in Argentina with Pastor Cymbala. At the time I was pursuing a secular career. Pastor Cymbala asked me if I would go with him on this trip. It was a pastors’ conference, and he wanted me to sing in Spanish because I’m fluent in Spanish—bilingual. I said, “Absolutely. I’d love to go with you.” (Listen carefully to where I’m going, ladies.) You see, I loved the Lord. “I’m going on this missions trip; I’ll be glad to go.” (My husband stayed home with the kids; of course, I’ll go!) So I went to Argentina, to Tucuman, not Buenos Aires. And little did I know that God would meet me there! But let me tell you how and why. God took me to a place where I saw people who loved God like I had never in my life seen people love God. Listen to me, I was raised by a godly mother and a godly father who are still alive and who are still godly people. It’s not like I hadn’t seen people that loved God in my life. But like they loved God? No! Yes, they were extremely poor. For instance, that pastors’ conference went four or five days, and most the pastors’ wives wore the exact same thing every night. We went in May, and they’re the opposite from us. That’s the beginning of their winter. So we were sitting in those churches—in May 1988—with our coats on! I took it off just to sing, but when I sat back down, I’m freezing. We’re freezing! Little kids are running around with their runny noses, and people who just sat in the presence of God didn’t want to go anywhere. After one of the services while we were there, Pastor Cymbala was asked to come forward, because they were going to anoint four or five couples who were leaving to start churches in other parts of Argentina. So they come the five couples, and they’re all kneeling, and the head of this precious Christian movement (it’s not a denomination) knelt down with the first couple. We stood around them, and we’re all laying hands on the first couple. And Pastor Ugal (that was his name) and his wife began to pray for that first couple. This was at the end of the service. Pastor Cymbala had already preached; we’d had a worship time. Now we were going to have time praying for them and just anointing them. We were in Tucuman. By the way, Tucuman, Argentina is “not exactly!” Do you remember that commercial with “not exactly”? “Honey, did you rent a Hertz?” [The reply is:] “Not exactly.” It was that commercial. So Tucuman is “not exactly!” The hotel I stayed at didn’t even have a phone in the room. My little bed went like this, and the shower was kind of a joke. It was clean. It was very, very clean, but it was very, very . . . not exactly! I say that to say that there was not really any . . . Like, in New York City, afterwards you can go out for coffee. New York never sleeps, and you find things to do. You can walk around and see Rockefeller Center, the flags, and the lights. It’s just “wow!” Tucuman is a poor little city—no place to go—that’s what I’m saying. So they’re praying for the first couple, and we’re all kind of praying. Pastor Ugal and his wife begin to pray for that couple like you would pray if that was your son or your daughter if they were going to Siberia and you knew you would never see them again! You would not go [in a sing-song voice]: “Dear God, thank You so much for calling them. Bless them. Amen. . . . Next!” That is not how you would pray! I remember the way the Holy Spirit gave them words to pray. They did not run out of words. They were praying as the Spirit led them. I mean, things like, “Lord, protect them and use them with power, and deliver them, and be with them, and give them an anointing.” But words that never ended! Like the Holy Spirit says He will help you pray. Oh, my goodness. It didn’t end, and it was unbelievable . . . and they weren’t repeating. (You know how some people repeat themselves? You pray with them, and you want to go, “You said that already, honey. Let’s end this. We are now going in circles here.”) They were not going in circles. It was like God praying through them! [God says]: “You honor me with your lips but your heart is far from me.” And the Lord said to me right at that moment as I’m going “Si, Senor!”. . . “Damaris, you’re in Tucuman. You have plans tonight? Are going somewhere?” Just like that, folks. And I know it’s funny—don’t get me wrong—but that’s how far I was. See what I’m telling you? I’m not in drugs, I’m not in prostitution, but I’m far (lips near, but heart far from God). And the Lord said to me that night, “Look at you. What can be better than to be in My presence? And you don’t want to be here!” Because God knows it, and He knew that was the truth. God said that to me, such conviction, such godly sorrow, such shame came over me that. I didn’t do it because I knew I would freak people out if I did it, but I wanted to scream at the moment, “I repent!” in Spanish. Literally. He showed me the condition of my heart: “You don’t even want to be in My presence. Look at you.” This is why I love this psalm, because you see in the last verse, David talks about, “I will dwell in the house of the Lord forever” (v. 6). That word “dwell,” that’s the same word for “tabernacle.” God made us so that we might dwell with Him. He wanted so badly to dwell with us. When the Israelites left Egypt, He made and gave instruction for that tabernacle to be built so that He might dwell there with them so that He might be their God and be who they talk about. Then the Scripture says Jesus (the Word) became flesh and dwelt among us ( see John 1:14). It really means that Jesus became flesh and “tabernacle-ed” with us. Nancy: We’ve been listening to Damaris Carbaugh, and she’s going to continue helping us find that kind of intimate relationship with the Lord, all this week. If you’re in the middle of a busy day, Damaris has been inviting you to take some time and make sure your number one thing is your relationship with Christ. Damaris was recently with us at Mujer Verdadera '17. That’s the True Woman conference that took place in Mexico just about a month ago. She’ll also be joining us at Revive '17: Women Mentoring Women. 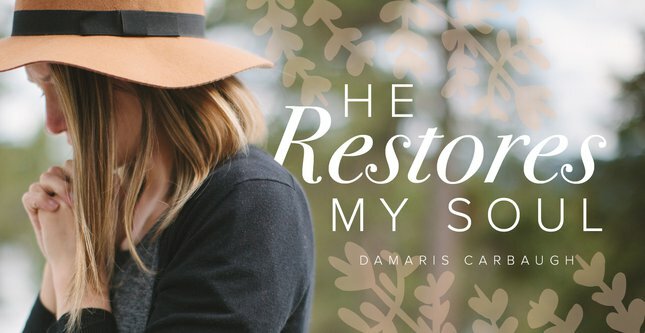 At that conference, Damaris will be joining me—and a number of other speakers—to help us walk through Titus 2. Together, we’ll learn how to live out the beauty of the gospel, and we’ll see how to encourage and disciple other women in doing the same as well. You can still get in on the early registration discount. That discount ends next Monday, May 1. You can get more information at ReviveOurHearts.com or by giving us a call at 1–800–569–5959. Leslie: Thanks, Nancy. If you’ve walked through the valley of the shadow of death, you are not alone. Damaris Carbaugh’s season of depression came to a head one day. Damaris: I walked through that valley that day, and I can tell you now that I don’t have to fear evil. I don’t have to fear Satan, because Jesus is with me. Leslie: Hear about that tomorrow, here on Revive Our Hearts. Revive Our Hearts with Nancy DeMoss Wolgemuth wants to help you find true peace. It’s an outreach of Life Action Ministries. Scripture is taken from the NASB.